I mean maybe it’s because he talks a good game and because he weighs so much that Eddie Hearn thinks you could sell a fight between him and “AJ”, but the idea of Joshua Vs Miller being announced soon just totally underwhelms me. That’s coming from a boxing fan who generally doesn’t complain too much about fights, I’m generally happy with whatever gets offered to us but there’s just something about this fight that I cannot get excited for. If a boxing fan like me isn’t happy about this fight, then I really struggle to see how many other boxing fans are going to get “excited” for this fight! The only good thing about it, is that it’ll most likely be “free” on DAZN? Tyson Fury, Deontay Wilder or Dillian Whyte. 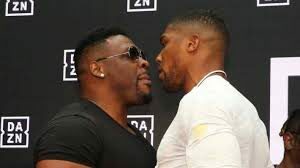 Whilst in an ideal World, it would be great to see “AJ” take on one of these top 3 heavyweights, politics in boxing makes life incredibly difficult; so it seems we’ll have to settle for a fight with the likes of “Big Baby” Miller, but my question remains the same – will the fans be satisfied? I really don’t think they will and if big fights aren’t made for Joshua in the second half of the year, I can see a lot of fans turning on him and he may end up losing a lot of his appeal. Fingers crossed that a fight against Miller could actually be relatively exciting and then after that, we see Joshua in against Fury, Wilder or Whyte before Christmas! Posted in BOXING NEWS, COLUMNS BY TYLER "THE MIRACLE MAN" WHITE Tags: Anthony Joshua Vs. Jarrell Miller - Will the Fans be Satisfied?